In his breakthrough 1994 documentary Hoop Dreams, Chicago-based filmmaker Steve James and his collaborators, Peter Gilbert and Frederick Marx, spent upward of four years following two local basketball prospects, William Gates and Arthur Agee, as they went through high school, clinging to long-shot dreams while facing tremendous adversity. At the end of the journey, James made a film about much more than basketball—one about poverty and the tears in the social safety net, but also about family ties and human resilience. For James, the sport itself was just an access point into much larger issues. After his 1997 studio biopic Prefontaine failed to connect with critics and audiences, James returned to the documentary format for 2002’s Stevie, a devastating profile of Stephen Fielding, a troubled kid from downstate Illinois to whom James was a Big Brother while in college. Putting himself in front of the camera for the first time, James candidly addressed the extent—and the limits—of his responsibility to Stevie, and whether a man that damaged can ever truly change. For No Crossover: The Trial Of Allen Iverson, the latest in ESPN’s 30 For 30 documentary series, James again puts himself in front of the camera to help tell the story of the basketball star’s troubled past in his hometown of Hampton, Virginia. On February 14, 1993, Iverson, then a football and basketball sensation for Bethel High School, was implicated in a brawl at a bowling alley between his young, black friends and a group of older white men. Then 17, Iverson was accused of hitting a woman over the head with a chair; after a trial that divided the city sharply along racial lines, he served four months in jail and was granted clemency by departing Virginia governor Douglas Wilder. In No Crossover, James seeks some perspective on what happened and how it reflects the attitudes that still persist in the city’s white and black communities. The film premières tonight on ESPN at 8 p.m. ET. James recently spoke to The A.V. Club about Iverson, putting himself on camera, and where the subjects of his past films are now. The A.V. Club: How did No Crossover come together? 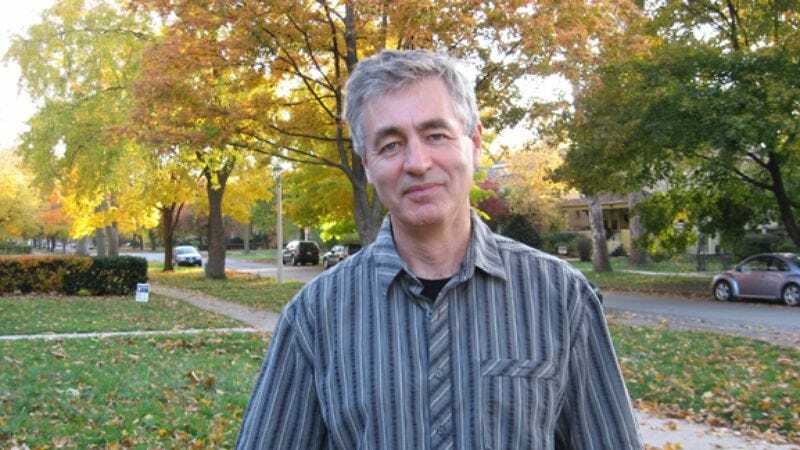 Steve James: I was approached by ESPN to come in and meet with them about the series. They reached out to a number of filmmakers, and because of Hoop Dreams, I was an obvious choice for them to see if I was interested and had an idea to pitch to them. They didn’t come to me and say, “Hey, do you want to tell this story?” They said, “Hey, we’re doing this series. Do you have ideas that you want to talk to us about for films for it?” They explained to me what they wanted to do: It had to be a story within the last 30 years. It had to be a story that has not been told already, a story that I thought was significant, and maybe most importantly, a story that in some way personally resonated. That was an important component for them going in. This was the story I thought of, because back when it was all happening, I was finishing Hoop Dreams and I was thinking I should be back in my hometown documenting what’s going on. But how many basketball films can you do at once? I thought of it as sort of a missed opportunity to do something, because at the time, I knew something very significant was going on in my hometown, and I thought I had something larger to say about it, too. So I just went away and thought about it over the years, and when this came along, I thought, “Well, what about now?” I just thought it’d be interesting to go back to Hampton 17 years later, and they agreed. AVC: You first put yourself in front of the camera for Stevie, for obvious reasons. What was behind the decision to bring yourself and your family into the picture here? Do you have any guiding principles about how to do first-person documentaries? SJ: I know this may sound disingenuous at this point, but when I began my career in making films, I had no intention of being on-camera at all. In fact, if anything, I was one of these people who kind of had an attitude about filmmakers who put themselves in their films. It really had to work, or I was very dismissive of that whole idea. So with Stevie, I think for obvious reasons, it felt like the right thing to do. It felt like the only honest thing to do. In many respects, I think Stevie is the most honest movie I’ve ever made. So with this film, when I first talked to ESPN about it, I saw myself narrating it in some fashion and bringing a sense of having grown up [in Hampton] and having played basketball there—though I averaged about 20 points less per game than Iverson. [Laughs.] I didn’t necessarily have the intention of being in the film to the degree I was, and at that point, I definitely hadn’t considered interviewing my mom in it, either. I didn’t even know she’d be willing to do it, but I think the film just kind of evolved like the way it did for Stevie, but for different reasons. I felt like if I could take account of my own personal experience growing up in Hampton—and to some degree, my parents’ experience through my mom—that it would be a shorthand way to give a better understanding of the community itself without going through a dry history or talking to experts or whatever. As I went along, I also felt that given [No Crossover] was largely about this racial divide over Iverson, if I’m going to tell this story as a white former resident of Hampton, I owed it to the audience to position myself in that community and reveal who I was and where I came from. That was made crystal-clear to me at the point when Joyce Hobson [an African-American teacher who organized support for Iverson in the black community —ed.] finally agreed to an interview and I asked her, as you see in the film, why she had been resistant, and she candidly tells why. At that point, I felt that I had truly made the right decision in telling this from a more personal point of view. What’s interesting is, Joyce Hobson might have been more willing to be interviewed by a white filmmaker about this if I hadn’t been from Hampton. My roots there really helped me in a lot of respects to get access to people and get people to be agreeable. There’s no question about that. It didn’t work in every case, as you learn in the film. But with someone like Joyce Hobson, I might have been better off being a complete outsider, because until she got to know me through all our various phone calls, she looked at me as a white journalist who’s from here and has all the potential baggage that she saw in the white community as being a problem for people like her in black community. AVC: Did you send her copies of your films so she could better understand your approach? SJ: You know, I offered to send her Hoop Dreams, and frankly, I can’t remember if she’d seen Hoop Dreams already or not. Hoop Dreams certainly was a door-opener for a lot of folks. And that’s been true for every film I’ve done. Sometimes it backfires, like if I want to shoot in a school. I tend to not mention Hoop Dreams by way of trying to get access to a school, because they’re like, “No, we definitely don’t want you in here.” Frankly, I can’t remember if she’d seen Hoop Dreams. She certainly knew of it. Maybe Hoop Dreams made her willing to carry on this phone conversation over the course of maybe literally a year. Periodically, when I would come to town, I would call her and say, “Joyce, we’re coming to town again. I would love to sit down and interview you.” We would talk on the phone a little while. She would talk about her feelings about what happened then, and I would say, “This is why we need you to be in the film,” and she would say, “I’m not sure I want to do that.” But she’d never said, “Okay, just stop calling me. Leave me alone.” So of course, I didn’t leave her alone. AVC: It’s been 17 years since that incident in Hampton, yet Iverson continues to be a polarizing figure in basketball today. To what degree is he culpable for his image problems? And how much do you think is out of his control? SJ: I think if you ask 10 different people, you’ll get 10 different answers. I think what [Daily Press reporter] David Teel says in the film is true: Some people in Hampton are just unwilling to forget or forgive what happened back then, if they’re against Allen. And Allen has not done himself any favors in that regard, by being someone who has consistently, over the years, gotten into some trouble. I think if you asked Allen this very same question—and I’ve never met him, unfortunately, and never spoken to him—but I think he would say, “Some of it has been out of my control. Some of it has been people drawing conclusions about me that are unfair, and some of it has been my own doing.” There’s even a point in the film [during his 2006 interview with Stephen A. Smith] where Iverson says he “deserved” to be where he was at that time. I think part of what makes Allen such an interesting athlete is the fact that he’s one of the most unguarded public figures in sports. He doesn’t talk in coach-speak. You never feel like he’s packaging himself. You always feel like you’re getting a genuine response from him, and he wears his emotions outwardly. For some people, that’s a sign of immaturity, and for other people, it’s a sign of authenticity. I’ve lived in Chicago for 25 years, and people always ask, “Are you a Cubs or a Sox fan?” Well, you know what, I wasn’t born here, so I’m not really either. I can appreciate both teams for their strengths and their weaknesses. I sort of feel the same way about Allen Iverson. This may be a wishy-washy thing to say, but I look at him and I feel like I have a complicated understanding of him, and I tried in the film to make you understand more about him, more about how this guy, at the age of 17, went through a very defining moment in his life—and a moment in the life of his community. I hope people seeing this film understand him better, regardless of how they feel about him. That was my goal: Not to redeem him and certainly not to condemn him, but to maybe hopefully have you understand him. AVC: The film doesn’t lead to a single conclusion. It has the effect of clarifying the issue while muddying it as the same time. SJ: I’m definitely glad you said that. If I could engineer a response to this movie, it would be basically that you come out the other end asking a lot of questions and debating a lot of questions. It was really important to me in this film—and it’s important to me in all the films I do—that you hear all sides to this situation. Your hear from people in the African-American community who were adamant in their support of Allen, and there were also people in the African-American community who weren’t. I couldn’t get someone to go on-camera and say, “I really wanted Allen to go to prison.” But you certainly hear from people who convey that, and that’s discussed in the film. And by the same token, I really wanted to hear people in the white community speak candidly about their feelings about Iverson and this case, and I think you get that very strongly, too. I also think you get folks in the white community who felt very differently. And I really give credit to the people in the film, because there are people who didn’t want to be in the film, and didn’t want to talk about it again. The thing that was amazing about it to me was that none of them said, “Well, I thought this way back then, but now that I look back on it, I feel this way.” People feel just as strongly today, and their positions haven’t changed. Though they’re talking about something that happened 17 years ago, it feels to me like it happened yesterday. AVC: Virginia governor Bob McDonnell today announced the celebration of Confederate History Month, with no mention of slavery. [This interview was conducted Friday, April 2. Later in the day, after much controversy, McDonnell amended his declaration by including a line decrying the evils of slavery. —ed.] Clearly there is still a lot of turbulence in the state’s racial dynamics. SJ: To me, it speaks to this incredible complexity of feelings we all have about race. What you just said there makes me think of the travel magazine in the film about Hampton, which read that Hampton was the place where African-Americans first “disembarked,” not mentioning the way in which they disembarked. They were slaves. But then, think about the other side for a second. Virginia elected the first black governor in the United States, back when Iverson was in high school. And you can look at Obama’s election, as many people have and should, and say, “Wow. What a statement about progress.” I was down in Grant Park [in Chicago] that night with my youngest son, that night that Obama won the election. I count that as one of the most precious memories and one of the proudest moments for me as a citizen. So you look at that and then you look at some of what’s gone on during his presidency, and you look at this thing you just told me about, and it’s like, “Here’s a state that elected the first black governor in the country, and yet here we are, 20 years later, and this happens.” So I think it just speaks to the fact that, for all our progress in some respects, we still keep going around on the same wheel. It is sort of one step forward, two steps backward. I don’t have an explanation for that. I’m not smart enough to understand how that happens, but there you go. It doesn’t surprise me that Virginia did that, having made this film. It also doesn’t surprise me that they went for Obama in the last election, and that they elected the first black governor. It brings me back to my mom. I didn’t want to overwhelm the film with the personal part of it, and I hope to God I didn’t, because I would really feel bad if people came away from the film saying, “He’s got this great story about Allen Iverson, and he feels the need to insert himself in it. What an egomaniac.” But when you look at my mom, here’s a woman who had this profound experience of racial integration, when she was a nurse and went into a formerly all-black school. I would run into African-Americans when we were making this film and they would say, “Who are you?” and I’d say “My mom is Mo James.” And they’d say, “Mo James! Tell her ‘Hi.’ I haven’t seen her in years! She was my school nurse when I was at Pembroke [High School].” But my mom is the very same person who, when this Allen Iverson thing happened, sided with those who said “This guy really needs to be punished.” Race is a complicated experience, and I think it’s complicated for blacks and whites. SJ: It was one of the conspiracy theories. That’s one of the things that was so surprising in making the film, all the conspiracy theories. That’s why I spend a section of the movie on it. The thing about conspiracy theories in general is, the one that makes the most sense is the one that resonates with you most personally. So of all the conspiracy theories I uncover and detail in the film, the one that makes the most sense to me is that one. That if Allen had played at Hampton, the historic lynchpin school of the community—and where I went to school—then it would have been different. I think you can make an argument that that was true. Part of what goes on is that people are grappling to make sense of it, and that can happen in a small-scale way, like in Hampton with an instance like this, and it can happen on a much more larger scale, with everything from 9/11 and all the wild conspiracy theories that came out it, to Obama now. Look at all the conspiracy theories about Obama: That he’s Hitler. That he’s not a citizen. That he’s a communist and a fascist, which is an amazing double. I think that when people can’t make sense of things, that’s fertile ground for conspiracy theories. AVC: How did Iverson’s absence affect the making of this film? SJ: At the start, ESPN came to me and said, “We’re very interested in this. We think this could be a good film, one we would like to do.” They also said, “Do you think we can get Iverson?” And I replied, “Well, maybe you guys can help us get Iverson, because you’re ESPN.” [Laughs.] But I said, “I wouldn’t be surprised at all if he declines to participate, given what this film’s about and the time in his life it’s about. I wouldn’t be surprised if he says no. So don’t make your decision to go forward with the expectation that Allen’s going be a part of this, because 1) the best chance to get Allen to be a part of it is to be able to say to him or his representative, ‘We’re making the film regardless.’ And 2) ultimately, I think there’s an important story to tell here, whether Allen participates or not.” It makes the film more about the community. It makes it more about how he was perceived, because in the ultimate analysis, who Allen really was and what Allen really thought and felt during that time was less important than how he was perceived by both the white and black communities and by the justice system. I didn’t expect Allen to participate from the get-go. We certainly made a concerted effort to try and get him involved, but I like the film we were able to make. And he is in the film. I knew and ESPN knew that there would be interviews from the time, and we lean on that to some degree, and subsequent interviews. I knew about the Stephen A. Smith hourlong interview that he did with Allen a few years ago. That was a really significant interview. So I knew we could get Allen’s voice in the film. It’s important that Allen’s voice be in the film, no question, but I don’t think we ultimately needed his voice from the present looking back. That’s why if I ever got the chance to sit down with Allen Iverson and talk about this, the thing I don’t really care to talk about is what happened in the bowling alley. I want to talk about how he felt about his community growing up, black and white, and how this incident affected him and changed who he was, and how he felt about his community coming out of it. I’m interested, in a sense, in talking to him about the community, not all of the, “Did you do it or not? Where were you?” That kind of thing. AVC: When Allen says in the Stephen A. Smith interview that he “deserved” to be where he was at the time, it doesn’t necessarily sound like an admission of guilt. SJ: I think it’s one of those moments where you have to decide as a viewer exactly what he means by that. If you’re inclined to think he was guilty, you can read that and say, “Well, he’s basically admitting he was guilty.” But Allen is one of these guys who I think feels a tremendous amount of responsibility for where he finds himself in his life. You see it in every interview he does. The emotional quality of his responses in the last year, both at the press conference we have in the film at his camp, all the way up to when he joined the [Philadelphia] ’76ers. I think we quoted him as saying, “I’ve made mistakes in my life that have caused people to not see the real me.” I think he feels a tremendous burden of responsibility over how people view him. At the same time, he’s this incredibly defiant guy, both as a player and as a person. It’s part of what makes him so interesting, I think. AVC: You’re heavily invested in the subjects in your films, and the audience is too, particularly William Gates and Arthur Agee in Hoop Dreams and Stephen Fielding in Stevie. Do you have any updates on them? SJ: William and Arthur both still live here in Chicago. Arthur lives in Berwyn, which used to be all white, but is now quite diverse. Arthur’s got a small foundation he started with his father, where he goes and speaks to kids about his life experiences and growing up. And he’s been pursuing, for a number of years now and with our blessing, a Hoop Dreams clothing and shoe line. He’s been chasing this for a long time, and it really is his hoop dream now. He seems to feel like he’s making progress, and this is eventually going to happen. He came to us some years ago and asked, “Can I use the name and just go and do it?” And we just said, “Go forth and prosper.” He’s been doing that. You probably know that Bo Agee [Arthur’s father] was murdered four or five years ago. Bo was murdered in his garage in Berwyn, and that certainly had a profound impact on the family. It resulted in Arthur’s mom Sheila moving back to Alabama, which is where she’s from, and living in proximity to family there. I talked to Sheila not too long ago. She was up here in Chicago, and we talked and were going to try and get together, and it just didn’t happen. We had a nice conversation on the phone. She seems to be doing well. Arthur seems to be doing well. So I think everything’s going pretty well for them. They seem to have gotten through all of that. William is a pastor [at Living Faith Community Center] in Cabrini Green. He doesn’t live in Cabrini Green anymore. He lives quite close to me. I live in Oak Park, and he lives on the far west side. He’s married to Catherine, who was his girlfriend in the film. They have four children: three boys and Alicia, who was the girl born in the film, who’s now studying dental hygiene in college. William is a pastor and runs an after-school program in Cabrini. He’s a model citizen. Terrific families. Kids are great. His oldest son is a freshman at St. Joseph High School and is playing on the basketball team, believe it or not. He wasn’t even born when we made the film. That’s the story on those guys. Now, Stevie, in the last few months, was released from prison. He served his 10 years. Some people are surprised by that, because the film didn’t come out until late 2002, early 2003, but we stopped filming in ’99 and then he went off to prison. He’s getting settled in. It’s not clear whether he’s going to live in Southern Illinois or Indiana at this point, but he’s out, and I’ve been in contact with him. At some point, I want to go down there and visit with him, or he’ll make a trip to Chicago and I’ll see him then. We stayed in contact through the years, obviously. I’m hopeful that things are going to work out for him, but it’s hard to believe it’s been 10 years since he went off to prison.